(CNN) – Isn't it great when you can say, "I knew him when?" Well if you listen to this week's edition of CNN Radio Music Notes, you may be able to say exactly that. Musician Shay Mooney describes himself as "a redneck in an urban world," but he's a redneck with a whole lot of soul. 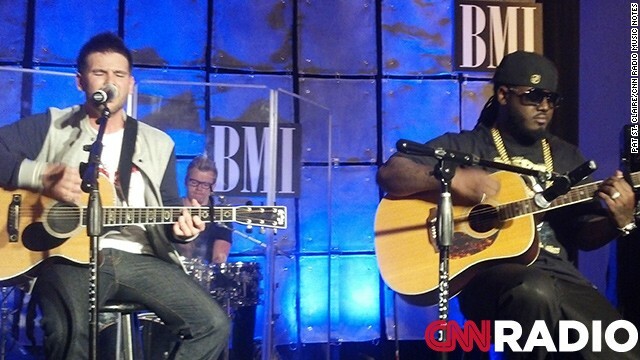 CNN caught up with him last year in Atlanta when he performed at a BMI music event for new artists. [1:12] "I've never been a huge fan of just kind of planning out your whole life...I think you just have to kind of live each day as it comes.'" Shay writes his owns songs and plays piano and guitar. He grew up in a large Southern family in the tiny town of Natural Dam, Arkansas, population: 500. [2:23] "Every song, I think has its own, you know, emotion to it... when you hear that song you should be like, 'oh my gosh this is the funnest song I've every heard in my life.'" [4:39] "This guy writes a song in three seconds. I like the speed, it just happens so fast and we can move on to the next thing. I mean you can't find that any more. That's a diamond in the rough right there." Since we first talked with Shay last year, he has moved to Nashville. Mooney has a new single coming out this Spring.